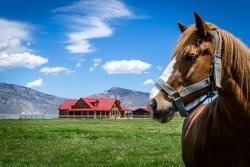 Enjoy numerous local events during your stay in Cody! From the world famous Cody Nite Rodeo, to summer concerts, fairs and festivals, and parades, there's something for everyone! Every rodeo performance is approximately 2 hours long with all rodeo events from bronc riding to bull riding and team roping to barrel racing for adults and kids. The kids in the audience can also participate as well in our kids calf scramble. The Cody Night Rodeo has rodeo performances every night June 1st through August 31st. Gates open at 7:00 p.m. with rodeo action starting at 8:00 p.m. Tickets are available at our down town ticket office 1031 12th, at the gate, or from one of our 50 ticket vendors in town including motels, hotels, R.V. parks, and various businesses. All seating is general admission including wheel chair accessible handicap seating. To get tickets online please visit the Cody Stampede Rodeo website. Stampede Park has amble parking including handicap parking as well as accommodating for large buses or R.V.`s. The Cody Night Rodeo welcomes large groups from bus tours to family reunions and offers various discounts please contact our office for more information. Enjoy an action packed evening on the front porch of the historic Irma Hotel every evening from May through September at 6:00 p.m. as the Cody Gunfighters duel on the streets! Location: Park County Complex lawn. 1501 Stampede Ave.
Jake Clark�s Mule Days was established in 1997 and highlights the diverse ability of the American Saddle Mule. Mules show off their abilities at the all mule rodeo, jack pot team roping and barrel racing. Mounted shooting competition, all mule parade, great rib eye steak dinner and barn dance. Quality mules sold at the Select Mule Auction.